MIG welding or Metallic Inert Gas welding is a consumable electrode welding process offering fast metal fill rates and high current joining. 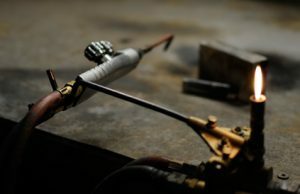 The filler wire is continuously fed through the gun at an operator predetermined flow rate dependent upon the amps required for the parts being joined. The filler wire also acts as the electrode and is where the arc is established and molten pool formed. 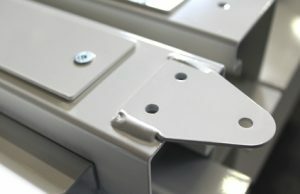 The system offers low distortion when used with specific joint configurations and both parent metals are fused in the joining process. The process is suitable for mild steel, stainless steel and aluminium joining’ it is suitable to sheet metal work and general fabrications. This type of welding generally requires a lower skill level than TIG welding. TIG welding or Tungsten inert gas welding is a non-consumable electrode welding process where the filler wire is added separately. The arc is established between a tungsten electrode and the work-piece with the resulting high temperature arc creating the molten pool. This process can give a small neat weld but due to the slower speed usually obtained can produce more distortion in the sheet metal fabrication. In this process, as with MIG welding, both parent metals are fused in the joining process. 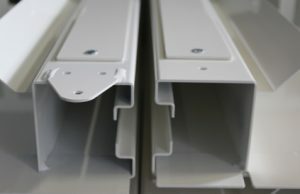 Suitable for mild steel, stainless steel and aluminium joining. TIG welding, due to the more precise nature of the welding process generally requires a higher level of skill to perform. This is a joining process relies on the electrical resistance of the material to be joined to create the heat required to produce the weld. The process requires an electrical current which is passed through two copper electrodes one directly above the other. The materials to be joined are placed together one above the other. The two electrodes are brought together to clamp the work pieces to be joined and the current flows. The resistance of the work-pieces create heat and produces a small molten pool or slug which welds the pieces together to form a joint. This method of welding is a semi-skilled application. 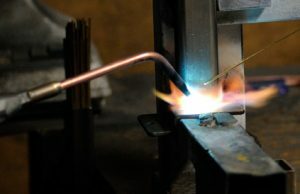 Brazing is a lower temperature method of metal joining and is where the parent metals are not melted but a brazing filler rod is sweated to form the joint. Flux is required which can be applied in either a paste or through the fuel line in the form of a gas. This method of joining gives a smooth join especially in a fillet configuration. Suitable for mild and stainless steels.